Our own Amanda Stiles has rightfully chastised me for my prolonged absence here on the Launch Pad--shamefully, my most recent contribution was more than two months ago, and even that was a cross-post to something I had up at the Huffington Post. Artfully done, Ms. Stiles. Here's to better performance on my part in the future! For my grand return, I thought I'd tackle a subject that's been on my mind lately: how, exactly, do I keep up with all of this MoonBots stuff? By way of a quick introduction: MoonBots, simply put, is the coolest dang educational program going on these days (no offense to my Progressive Insurance Automotive X PRIZE colleagues and their DASH+ contest, which is worthy of your time and attention, too). Along with our great partners, we challenged teams of students to essentially 'win the Google Lunar X PRIZE' with LEGOs. This happens in two phases: in Phase One, students have to do background research on the 'how' and 'why' of lunar exploration, and must use software to design a lunar robot; twenty finalists will advance to Phase Two, they'll need to actually build both a lunar surface (a "Moonscape") and the lunar robot, all using LEGO components. When we were designing this competition along with our friends at Google, LEGO, National Instruments, and WIRED's GeekDad blog, this was viewed almost like a pilot program. We knew we had a cool program, but weren't sure what to expect in terms of total registration. In the end, we established a basement target of 50 teams, and a 'stretch' goal of 100. You can imagine our pleasure, therefore, when registration closed and we had not 50, not 100, but 212 teams (and yes, I've been trying to think of a good boiling-point pun ever since)--it's a credit to the hard work that Chanda and others have put in, but also to the fact that, let's face it, LEGOs and the Google Lunar X PRIZE have a certain inherent appeal. The only downside--and I'm not sure you could even call it that--to have so many teams is that it's hard to keep up with all of them! To make that a little easier, I thought I'd build on Amanda's "How To" label here, and provide some quick tips on how to be a MoonBots fan. Registration is closed, as I mentioned above--that happened about two weeks ago. We were very happy that we were able to make registration completely free, and that was probably one of the reasons why we were able to register the 212 teams from 16 nations. At the end of last week, Phase One closed, meaning that all teams were required to submit several key items. Most importantly, beyond all of the parental consent forms, et cetera, they needed to submit a short, original video describing the importance of lunar exploration as well as their "Robot Design Proposal"--a digital design of the lunar robot they'll build if the team makes it to Phase Two. Somewhere on the order of three quarters of teams completed those requirements on time. Those videos and those design proposals are conveniently collected at the MoonBots website. Let's take as an example the team Moon Conquerors--one of the first teams to register for the competition. Click on that link in the previous sentence (or, even better, right click or Control-click and open in a new tab) and you'll be taken to the Moon Conquerors team page on the MoonBots site. You'll see the team logo, their location on a map, and the names of the team members right at the top of the page. You'll also see a link to their Robot Design proposal right there. Finally, down below, you'll see a box with a thumbnail of their video entry--if you click that, it will pop up and play without you needing to navigate away from the team page. It's important to note that many of our MoonBots teams are going well above and beyond the call of duty, and are posting lots of blog posts, multiple videos, and several different images of their robot design. I highly encourage you to check that out--to do so, you'll want to follow the links from the team's page on the MoonBots site to the team's own site (in the case of the Moon Conquerors, it's here), as only the official requirements are posted to their page on the MoonBots site itself. By clicking around through the various team's pages and sites--use whichever method you like--you can start to get a sense both of the talent of these students and of which teams are your favorites. As you surf around, I highly encourage you to leave notes, questions, and comments for these students--feedback really makes a big difference for all of us, but it makes perhaps even more of a difference for young students fostering an interest in science, technology, and engineering. Viewing each team's page only takes a few minutes--their video essays are running about 3 minutes on average--so you can squeeze in a couple of teams during your lunch break or as the day is winding down. It's a fun way to stretch your brain. At a minimum, try click through whenever Chanda highlights teams here on the Launch Pad. Our judges are already starting to sort through these teams, with the unenviable task of down-selecting to just twenty Finalists. These Finalists will be announced in about three weeks time. 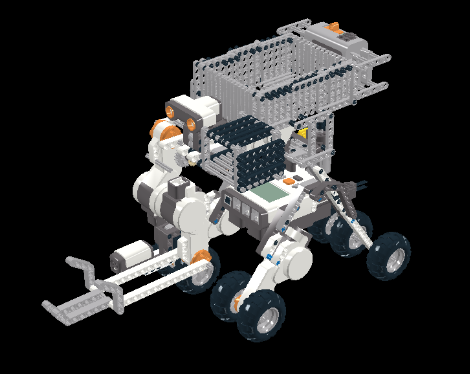 Each finalist will be sent a LEGO MINDSTORMS NXT 2.0 robotics kit and a box full of LEGOs that they'll use to construct a pretty large lunar surface--it's about 2 meters by 2 meters large (7 feet by 7 feet or so). The twenty teams will be generating a huge amount of content over the summer, as they blog and vlog their construction and testing process. The competition will wrap up in mid-August, when teams will need to roll out both a "Team Documentary" video as well as the actual test of their robot! It promises to be a lot of fun to watch. I hope you will indeed offer some encouraging words to the students who are working so hard on this process. The time you spend looking in to the teams will pay great rewards for all involved!